Trailhead and parking area are on Zealand Road in Jefferson, NH. Zealand Road leaves the west side of Rt. 302 2.2 miles east of Rt. 3. The parking area is 2.5 miles down the road, on the right. The hike to Mt. Hale is the shortest of any to a 4000-footer. Unfortunately, it is also the most viewless of any to a 4000-footer. Until 1972, the summit fire tower provided spectacular views in all directions; now, the only views to be found on the mountain are through the trees. Good views once could be found from atop Hale's five-foot tall summit cairn, but now that view is almost gone. Soon enough, all traces of views on Mt. Hale will disappear completely. For this reason, many 4000-footer climbers choose to save this hike for a bad weather day. Not all of Mt. Hale is boring, however. 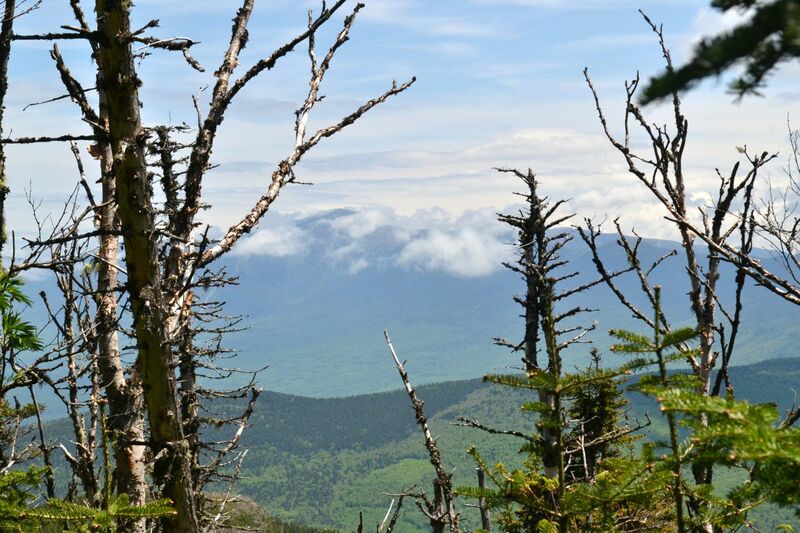 On the hike, you will see cascades, brooks, and pretty birch forests, as well as very small views from a blowdown patch near the summit. The hike begins on the Hale Brook Trail. The trail heads off into the forest, very quickly crossing a bridge over a small brook and a cross-country ski trail. It then begins a moderate climb. After half a mile, a herd path on the right leads to the top of a logged clearing (now growing back) with a view of Mt. Oscar. 0.2 miles after, the trail nears Hale Brook and another herd path leads to the base of a small cascade. The trail then crosses the brook and continues its climb away from it. Eventually, the trail grade eases as it traverses across the steep slope rising from Hale Brook. Fine birch stands are found here, as well as glimpses through the trees up toward Mt. Hale's east peak. Half a mile from the first crossing, the trail recrosses Hale Brook, now a smaller, cascading stream flowing steeply downhill. The easy climb continues toward much steeper terrain, which the trail ascends with four switchbacks. The forest becomes lush and mossy. After the switchbacks, the trail crosses a few smaller streams, then enters a more open forest and turns right to begin the final climb to the summit. This is where you will find slight views. By peeking through small openings in the dead trees around the blowdowns, you can glimpse views of the Willey Range and Zealand and Carrigain Notches. The best view is looking back over the trail to Mt. Washington. The summit of Mt. Hale is a large, grassy clearing with a huge cairn and a few artifacts from the fire tower. By standing on top of the cairn, you can see the tops of Mt. Field, Mt. Willey, and the Twins.